The GLSEN National School Climate Survey (pdf) is our flagship report on the school experiences of LGBTQ youth in schools, including the extent of the challenges that they face at school and the school-based resources that support LGBTQ students’ well-being. 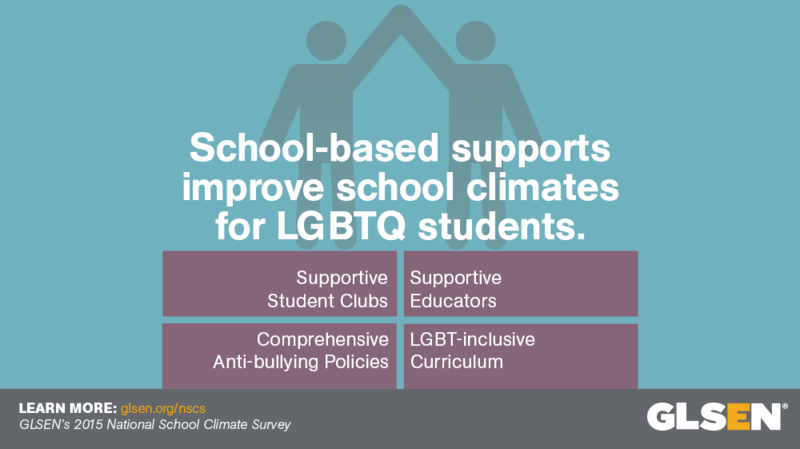 The survey has consistently indicated that specific school-based supports are related to a safer and more inclusive school climate, including: supportive educators, LGBT-inclusive curriculum, comprehensive anti-bullying policies, and supportive student clubs, such as Gay-Straight Alliances (GSAs). This report also examines demographic and school differences in students’ experiences, as well as changes in school climate over time. 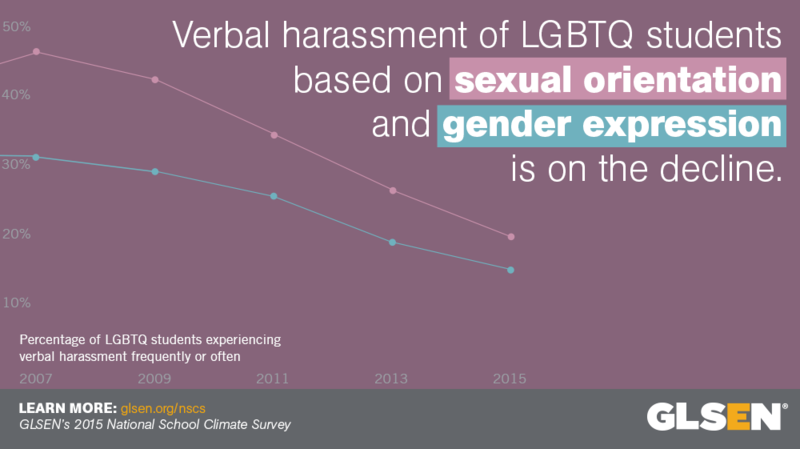 In addition, for the first time, this installment of GLSEN’s National School Climate Survey also includes insights on bisexual student experiences, school policies that specifically affect transgender students, and anti-bullying student education and asks students about discriminatory policies and practices around extracurricular activities and school events. Read the Press Release on the 2015 National School Climate Survey and look-up state specific snapshots for 30 states. An archive of past versions of The National School Climate Survey is available here. We welcome the use of these infographics, in full, in reports and presentations, and encourage sharing with social networks.